As discussed in my previous posts about “Is Your Cardio Optimal? Part 1 and Part 2“, there are some ways to better reach your goals than others. I will preface this post be saying this: Any form of exercise is great. 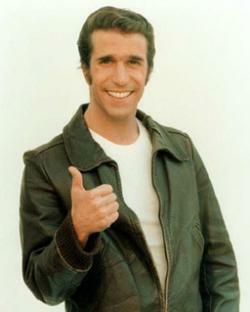 If you exercise 30-60 minutes most days of the week, you are doing awesome, give yourself a pat on the back. Its even better if your exercise doesn’t feel like “exercise”, but an enjoyable time spent improving your health and wellness. If you exercise, way to go! Here is why what he was doing was not optimal for his goals, and potentially dangerous. The idea of spot reduction, or working a certain area or body part over and over, to lose fat from that area just plain does not work. One such exercise that many people do to spot reduce is the side bend. Many people do these to try and get rid of love handles, and they often to them incorrectly. First, the spine has limited lateral flexion, and by bending too far down, you can risk spinal injury. Second, the side bend, if done at all, should be done with a heavy weight, on one side of the body. Bend to the side while bracing the abs, like you are about to get punched in the gut, just far enough until you feel a slight stretch, then return to standing up straight, not over to the other side. The “lovehandle” area is made up of the external and internal obliques. 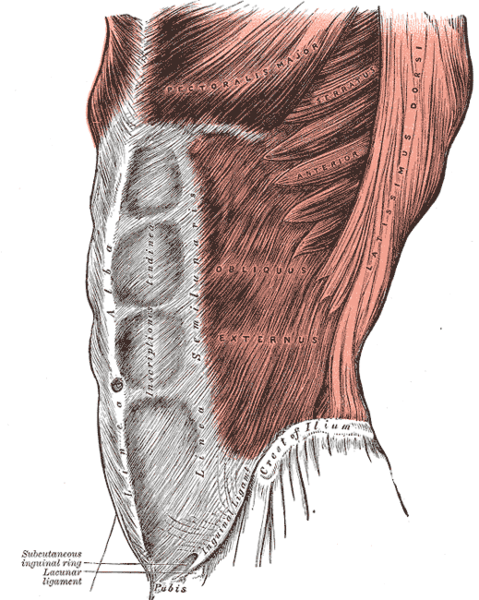 The main function of these muscles, as seen by how they are striated and run across the abdomen, is for forward flexion, or to pull the chest toward the abdomen, and some limited rotation of the spinal column. It is actually the internal obliques, which are deeper in the body, that function more for lateral flexion, or side bends. So even if spot reduction worked, you will never see your internal obliques. Training any other muscle for an hour straight would have you burning and hurting. Your abs CAN tolerate longer training sessions because they are constantly being working when you are standing, walking, sitting (upright with good posture) etc. Just because they can be trained for longer periods, doesnt mean they should be. As they get tired, you will start to get sloppy with form. This can increase the risk for back problems, spinal discomfort, hip flexor issues, pulled muscles, or many other problems. By the end of the workout, the guy in the gym just looked like a fish flopping out of water. He lost all control over his movements, was getting real sloppy, and flailing everywhere. There is no benefit to this. 3) So what to do? Training abs is great. They are a very important muscle group that we need to properly function all day. The main function of the abs and obliques is the keep proper posture and provide minor movements in all directions. When it comes to training abs, keep it functional for the most part. Some crunch variations wont hurt, as long as they are done under a controlled and proper manner. Since the abs function greatly for posture, train them this way. Do plank variations, front side, on a ball, etc. The Palloff Press is a great exercise as well. It is like a standing side plank, and the core should be braced the whole time. Look it up and give it a try. When it comes to really getting that summer six pack, I’m going to use a tried and true statement: “Abs Are Made In The Kitchen”. Everyone has a six pack. It is all about proper diet in addition to exercise to drop body fat. 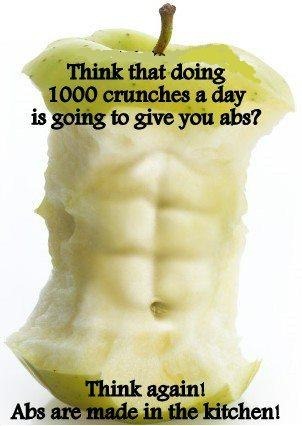 If you really want that summer six pack, spend more time preparing healthy meals, and less time doing endless crunches. This entry was posted in Fitness and tagged abs, diet, Exercise Blog, fat loss, health, nutrition, six pack, summer six pack, weight loss, weight training, wellness, workout by Mike Gorski. Bookmark the permalink.